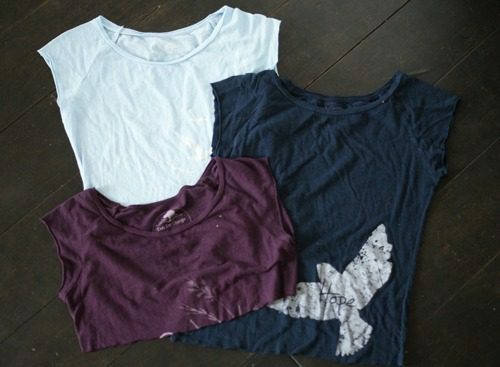 This week I’m seeing how many DIY projects I can get out of three old t-shirts. 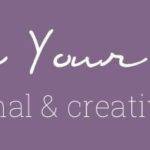 I’m not the craftiest person in the blogosphere, so if I can do these, anybody can! 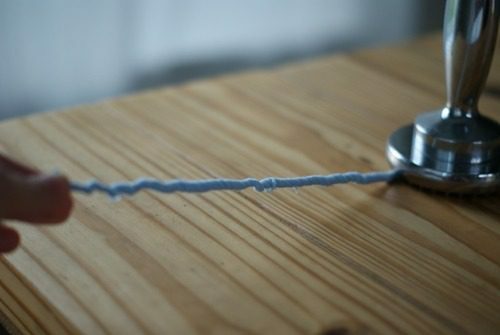 To start, cut a 1/2″ to 1″ strip from the bottom of a t-shirt (like we did for the t-shirt necklaces). If you’re making a tiny flower, you won’t need the full strip that you cut, but you’ll want to experiment some to see how much to use. Next, stretch out your strip until it forms a tube. Double up your strands and begin twisting the whole thing. You can do this with just your hands, but it’s pretty much impossible to twist and take a picture at the same time without some help, so I used my handy meat mallet to hold one end in place. 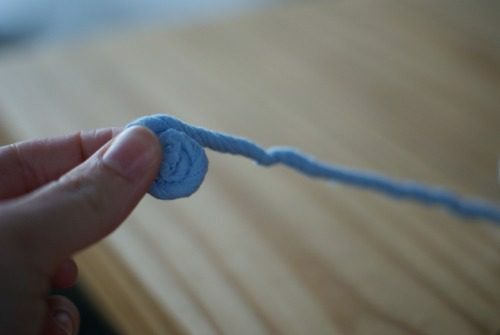 It should be twisted so much that when you let go, it curls around itself like this. Stretch it back out, though, because now we’re ready to make the flower. To start, dab a little bit of hot glue along the edge to keep the ends of your t-shirt tube together. Then, begin rolling it to form the flower, adding glue dots as you go. You could probably use fabric glue as well, but hot glue is much faster! I ended up gluing in three places per circle to keep the layers from separating as it go bigger. 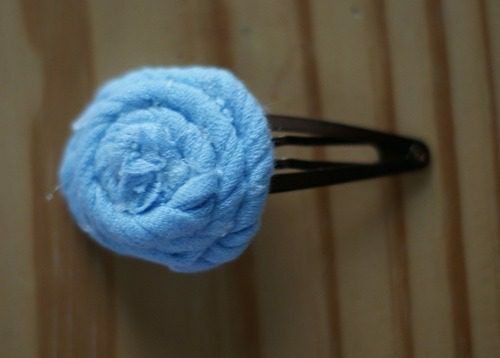 When you’re done, add a spot of glue to the bottom of your flower, right in the middle, and attach it to a barrette. Voila — quick and easy embellished barrettes! What else could you use these t-shirt flowers for?